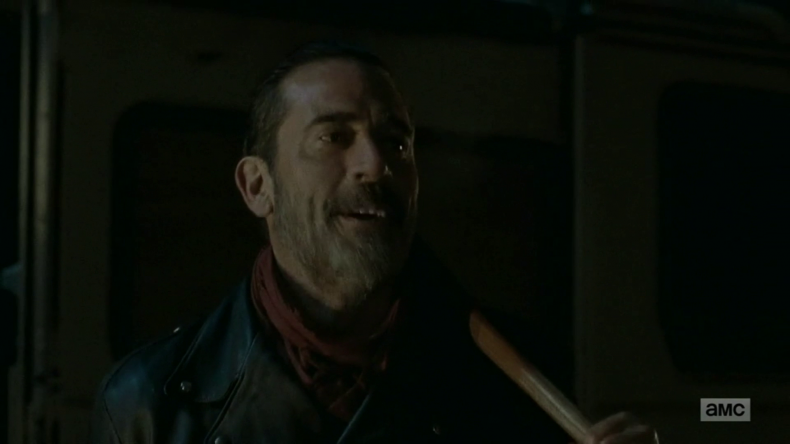 So you thought you could figure out who Negan kills in the season premiere of The Walking Dead by gathering intel from the set, did you? Think again! The production team was two steps ahead and filmed EVERYBODY getting bashed! According to The Hollywood Reporter, there are death scenes now in the can for Michonne, Glenn, Maggie, Abraham, Sasha, Daryl, Eugene, Aaron, and Rosita….and even Rick and Carl, two people already confimed to live. Only a handful of people know which footage will be picked up and spliced into the episode. Showrunner Scott M. Gimple says such extreme measures are necessary to deal with today’s overzealous fans –some of which have gone far enough to fly drones over the production set during outdoors scenes. “With the advent of drones, it can become such a game of cat and mouse that as far as sneaking a peek at the actors walking to set, we want to just keep our actors safe and the people who might be looking safe — like [when they’re] in the street.” There were no drones capturing any of Negan’s kills — the scene was shot in a studio lot. Before drones were even a thing, this kind of protective maneuver was used. The cast and crew of Empire Strikes Back received scripts that contained the line “Obi-Wan killed your father.” Only Lucas and James Earl Jones knew the truth. Later on, The Simpsons animated several different versions of the “Who Shot Mr. Burns” reveal, to prevent anyone at the animation studio from leaking the ending.